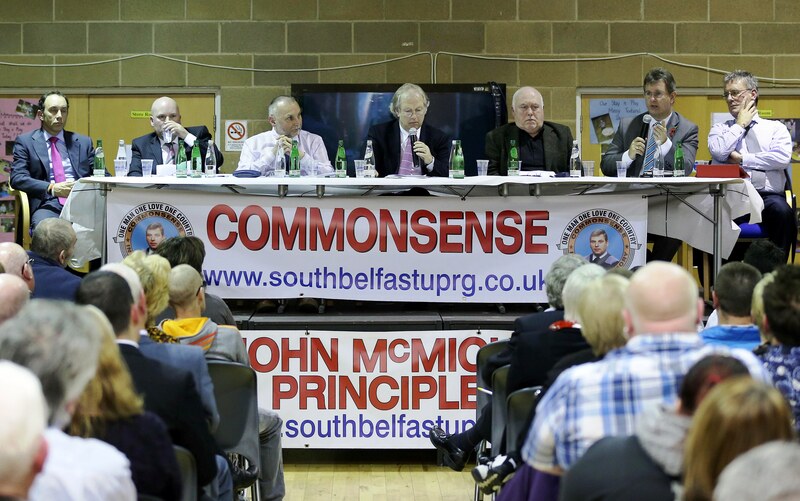 Last Thursday I was invited by Vince Curry of the UDA-linked Ulster Political Research Group to participate in a panel discussion in a loyalist area of Lisburn as part of the John McMichael Memorial Debate. John McMichael was probably the most military-minded (yet also politically-minded) loyalist paramilitary leader of the 1980s and was killed by the IRA in an explosion in December 1987, twenty-five years ago. He was thirty nine years-of-age. I had reservations about going and was a bit nervous about what to expect, yet myself and another former IRA prisoner Sean ‘Spike’ Murray were welcomed and given freedom of speech at the discussion which also included: Jeffrey Donaldson MP, Mike Nesbitt MLA, Conal McDevitt MLA and Paul Clissold of the Ulster Political Research Group. The clear force behind the initiative and in memorialising John McMichael is Jackie McDonald, a friend and comrade of McMichael. In the audience were John McMichael’s widow Shirley and his son Gary. Eamonn Mallie chaired in the absence of Peter Shirlow and through his jokes and quips certainly relaxed me and, I presume, others. The panel was probably too big to allow a fluid debate and it was also all-male. I made the point that regardless of the merits of McMichael’s document, ‘Common Sense’, which advocated power-sharing and a Bill of Rights, it also sought to copper-fasten the union with Britain by seeking to raise the bar by a proposal that any change in the status of the North would require a two-thirds majority, instead of the current simple majority. I also said that because of the conflict and the campaign by the UFF, few would take any loyalist paramilitary proposals seriously and scrutinise them, just as the IRA’s armed campaign inhibited anyone taking seriously the Sinn Féin documents, ‘A Scenario for Peace’ and ‘Towards a Lasting Peace’. This was the first time I had ever been invited by a loyalist group to address a loyalist meeting in a loyalist area and I am sure it was not an easy decision for them. The audience showed a lot of respect, there was little rancour but there are huge disparities between the political development of nationalists and republicans and the loyalists and their base. It may well be, I said, that if the loyalists have ‘missed the boat’ in terms of having their own individual political party (and a credible party) then the only way they might get their grievances resolved (including grievances regarding education standards in working-class areas) was by simply joining the mainstream DUP or UUP. It is also clear that loyalists perceive that the Historical Enquiries Team’s work is disproportionately directed at them. I said that republicans were also being arrested on an on-going basis regarding past actions and one only had to look at the case of Marion Price, who had been bailed by the courts only to be interned-without-trial by the British Secretary of State. How to deal with the past featured prominently in the discussion. Again, loyalists and mainstream unionists are generally suspicious about the Sinn Féin campaign on Truth and Reconciliation etc and believe it to be subterfuge for re-writing the past in the IRA’s image and for republicans to put Britain in the dock (over the dirty war and collusion etc.). I cannot see how these positions can be squared: no one is going to tell the whole truth and no protagonist can afford to, and victims, who do not represent a monolith, also have disparate demands in regards to the past and the truth. The victims, it seems, will remain stranded and disappointed. Given the impasse, the least the state can do is to ensure that their medical needs and essential comforts are met – and yet they often are not. 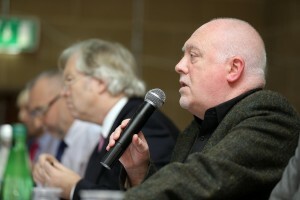 For me the most important aspect of the meeting was the courage of the organisers in inviting republicans like myself and Spike Murray into their area, given that we and John McMichael were opposing protagonists in an armed conflict and that republicans took this man’s life, widowed his wife and orphaned his children – as has happened to many on all sides. I was granted another glimpse into the loyalist mind-set and sensibilities which help inform one when thinking about a shared future, what is possible and what the limits are.